Peru is a country located in the Central Andes chock full of Incan and pre-Incan Nazca history. While the country has sections of the Amazon Rainforest and the Andes Highlands, it is also well known for being the home of the lost Incan City of Machu Picchu, one of the 7 World Wonders. Highlights of Peru include many cities such Lima, Cusco, Machu Picchu, Urubamba, and Puno. In addition, there is a vast amount of adventure waiting in Peru. Hike Incan Trails, bike ride through historic neighborhoods and coastal cliffs, or create an extensive and exciting Peru Tour. Whichever you choose, Columbus Travel can help you decide which Tour or Expedition in Peru is best for you or you can choose a trip our Destination Experts have already created. The Central Andes make up most of Peru, as well as Ecuador, Eastern Bolivia, and much of Argentina and Chile. These parts of the Andes are one of the best locations in the world for those who enjoy mountainous scenery, rich history, hiking and adventure. The Coastal cities offer fun in the sun, the high sierra of Peru lets visitors discover the mystery of ancient Incans and Nazca's. And furthermore, the Eastern Peruvian side of the Andes offers the splendors of the Amazon Rainforest where you can encounter some of nature's best kept secrets. 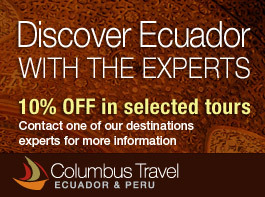 Search for any Ecuador Tour or Peru Tour our Destination Experts created with you in mind!